2017 was a year to speak out, be brave and stand for something. Goodbyes were made, new faces were welcomed, and songs in español inspired billions to dance and sing. And how can we forget how one man embarked on a journey through Latino history to enlighten the curious. It was a year of defying glass ceilings, uniting in the face of tragedy and speaking out against gender inequality and harassment. Here are some noble moments in Latino culture and entertainment, from movies and TV to Broadway and pop culture. "Coco" is the first Latino-themed movie from Pixar Animation Studios in its company's history. This love letter to Mexico about family remembrance topped the box-office for three straight weeks generating already over $400 million dollars globally. "Coco" is important because movies more than any other medium shape our view of the world, especially with children. To have Pixar create a diverse film of this magnitude, is a validation that Hispanic stories matter in the larger framework of American culture. Mexican director Guillermo del Toro has never won an Oscar award. His compatriotas Alfonso Cuarón and Alejandro Gonzalez Iñarritú have already amassed several between both. But in The Shape of Water, del Toro's most recent film about love at first sight between a monster and a mute, he's created his best shot of him joining his friends at the highest echelons of the Hollywood industry. Del Toro has already garnered 7 Golden Globe nominations and 14 nominations for the Critics Choice Awards. Argentinian director Andres Muschietti is one of the great stories in Hollywood this year. His R-rated Stephen King horror reboot "It," about a clown who terrorizes the children of a small town, arrived in September, smashing the month's record with a jaw-dropping $117.2 million in ticket sales. The film, and Muschietti, became the unheralded saviors of this year's box office summer slump. It was so grand, the film resulted in producing more money than the revered "Wonder Woman" on opening weekend. Muschietti is two for two. His first film "Mama" debuted at #1 and now "It". The future is bright for the Argentine filmmaker. One of the best documentaries of the year is "Dolores," based on the life of Latina activist and feminist, Dolores Huerta, who is still active at age 87 changing the lives of Latinos in America. In an interview earlier this year, rock legend Carlos Santana, executive producer and the main investor of the documentary, gave his mother credit for the inspiration to fund and produce the film. "After my mother passed, she told me, 'you have to do this, you must do this, and you will do this,'" said Santana. "Dolores" is a highly-illuminating, must-see film, of a historically overlooked woman who contributed enormously to fighting racial and labor injustices throughout her life. Arguably, the most recognizable female face in Spanish-language news, Maria Elena Salinas, the co-anchor of Univision Noticias and Aquí y Ahora, said goodbye to Latino viewers earlier this month after a professional career spanning more than three decades. "Now is the time to start over," she said. "Sometimes you have to make a drastic decision to change." The woman replacing Salinas is Colombian-born Ilia Calderón, the first Afro-Latina to anchor a leading national news desk in the United States. Calderón's interview with a Ku Klux Klan member in August, where he called her "a n***er," sent chills down the spine of viewers, ratcheting up racial tensions already boiling in America. In a year where the lack of Latino representation was blatant on TV and film, legendary producer Norman Lear decided to do something about it. He approved the reboot of his classic 70's sitcom "One Day at a Time" to be centered around a Latino family, and he put Gloria Calderon Kellett, an acclaimed Cuban-American executive producer and showrunner, in charge. The show follows the ups and downs of three generations of a Cuban-American family, starring Justina Machado and EGOT winner Rita Moreno. (For those of you who may not know, that means Emmy, Grammy, Oscar and Tony, all 4 wins!) According to Lear, he credits Brent Miller, a producing partner on the show, for opening his eyes with research that pointed to single Latina mothers being a very appealing audience to build a show around. The result has not only culminated in critical acclaim, but impacted the writers room where half the team is Latino and female. Oh, and the show is coming back to Netflix for season two in 2018. When it comes to music, Latinos were a force to reckon with in 2017. No other song this year reflected the impact of Latino music in the United States and globally than Luis Fonsiand Daddy Yankee's "Despacito". The catchy, upbeat track tied and set records galore: with the help of Justin Bieber, it spent an unbelievable 16 weeks on Billboard's Hot 100 tying Mariah Carey and Boyz II Men's "One Sweet Day", it obliterated the record for most-watched video of all time on YouTube with over 4.5 billion views as of this writing, and the song has been nominated for three Grammy awards including Record of the Year, Song of the Year and Best Pop Duo/Group Performance. If it it wins Song of the Year, it would be historic as it would become the first Spanish-song to ever achieve that mark. Keeping our fingers crossed! Another Latino musician close on the tails of Fonsi's global accomplishments is Colombian reggaeton star J Balvin. He legitimized Colombian's influence in the reggaeton genre this year as we saw him go from pop star to artist weaving hit after hit with songs such as "Si Tu Novio Te Deja Sola" with Bad Bunny, collaborating on French Montana's "Unforgettable" and flooring us with his colossal club hit "Mi Gente," which added global superstar Beyoncé to its remix. It spent 24 weeks on the US charts and peaked at #3 on the Hot 100 as "Queen Bae" sang and rapped with "gusto" in Spanish. What differentiates J Balvin from Fonsi and the rest of pop reggaetoneros is his ability to attract the biggest names in mainstream hip-hop to collaborate with him, allowing for his sound and Latin music as a whole to be embraced by a global audience. Dominican rapper Belcalis Almanzar, aka "Cardi B," arrived on the music scene in 2017 like a blazing meteor. Her single 'Bodak Yellow,' which was released in June, took America by storm skyrocketing to #1 on the Billboard Hot 100 for three consecutive weeks. She did a 'Latin Trap Remix' of the song rapping in Spanish with another Dominican hip hop artist, Messiah, to much fanfare. But she didn't stop there. Her next two vocal appearances in "No Limit" from G-Eazy (feat. A$AP Rocky) and "Motorsport" with Migos and Nicki Minaj, easily entered the top 10 on the Hot 100. Her year was capped off with two jaw-dropping Grammy nominations for Best Rap Performance and Best Rap Song. Belcalis exemplifies that it pays big to dream big. Colombian actor John Leguizamo left a mark on 2017. His Billboard article titled, "From Music to Movies to TV, Latinos Are Widely Underrepresented - And I'm Done With It" condensed and illuminated the incendiary facts surrounding the scarcity of Latino talent in Hollywood in front of and behind the camera, while sparking a national conversation about how to solve the glaring predicament. Some of his opinions on the matter are addressed in his new edifying Broadway play, "Latin History for Morons," in which he elucidates how the achievements of Latinos throughout history have been suppressed from history books and media. In an interview he gave Vogue Magazine in early April, he revealed there was a malicious question he kept being asked that spurred the motivation to develop the play… "What have Latin people done that's so great?" He answered, "I had to go back to our empires. In school, the things that you study are the wars, more than anything else in history. I wanted to address the very issues that people try to hurt us with." How rare is it to see two extravagantly famous, wealthy, successful U.S. Latino mega-stars together as a romantic couple? Very rare. The reason for it is because few of us have ever come close to living the surreal heights of this fascinating duo. Individually, JLo and A-Rod - if you need to know, Jennifer Lopez and Alex Rodriguez - each has reached the pinnacle of their industry, Hollywood and baseball, respectively. But side by side, their combined power is nothing short of astonishing. So far, they have helped collect millions of dollars in aid for the natural catastrophes in Puerto Rico and Mexico via charities and a telethon, have graced the cover of Vanity Fair (no easy feat to achieve for a minority group) and appeared at each other's events, all while being parents to their budding children. In the current climate of sexual harassment and assault against women in our country, Latino voices have oddly been absent. That fact ceased to exist when Mexican actress Salma Hayek wrote a New York Times op-eddeclaring she too was harassed by disgraced Hollywood producer Harvey Weinstein. The significance behind Hayek's disclosure is that she is the first Latina of prominence to speak out. The expectations for many is that more Latinas can now come forth and tell their personal stories as well as finding support from other women in their community. After Hurricane Maria and an earthquake devastated Puerto Rico and Mexico respectively in September, Jennifer Lopez and her ex-husband Marc Anthony, hit the phones to ask friends and colleagues to participate with donations and their time on the show. The response was overwhelming and a congregation of the biggest Latino and mainstream stars such as Selena Gomez, Vin Diesel, Gina Rodriguez, Daddy Yankee, Bruno Mars, Sofia Vergara, Demi Lovato, Ricky Martin, Kim Kardashian West and Chris Martin of Coldplay said yes to what would ultimately be known as the "Somos Una Voz! Benefit Concert." The star studded show raised $20 million dollars in one night, and for many Latino viewers, it was a rare moment to to see America truly feel united. And who can forget the amazing debut of'Almost Like Praying? 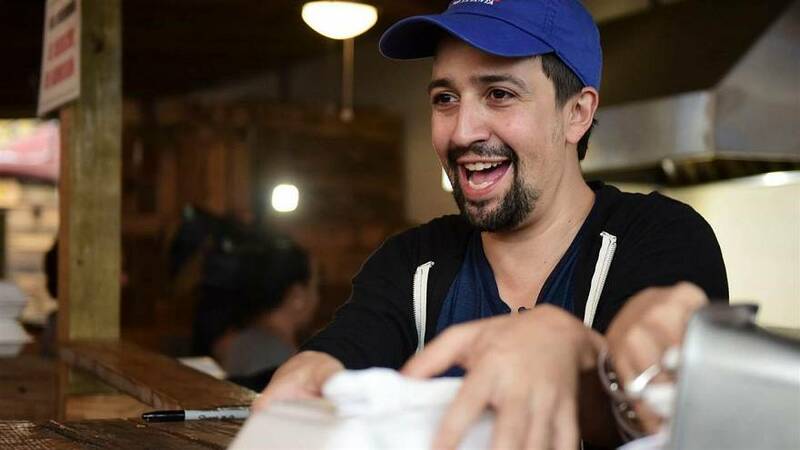 ',Lin-Manuel Miranda's ode to his beloved Puerto Rico? The high-profile star gathered a "who's who" of recording artists, sang the name of every Puerto Rican town, has raised millions for the island, organized ralliesand written opinion pieces, and reminded us that amid a tragedy of such magnitude, we are all "boricuas" in solidarity.